Finely chop the garlic and put to one side. This wants to sit for 10 minutes to fully activate the allicin before it’s put in the brine. 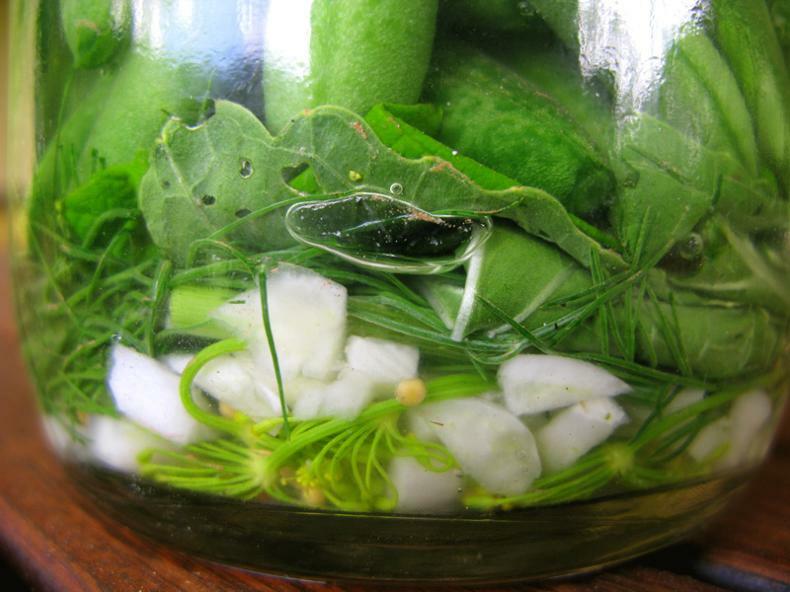 I added the sauerkraut liquid and mustard seeds to the jar, then went out to collect the dill, horseradish leaf and grape leaf from the garden. I upended the dill flower over the top of seed/kraut juice, then dropped the garlic in. I copped the dill then added it to the mix, then placed the horseradish leaf and the grape leaf over the top of that. The leaves are a source of tannin, to keep the beans crisp, and the horseradish in particular will add a little Eastern European bite (so, kind of like the Vampire of the fermenting world, except this bite increases the life force rather than sapping it!). Once the spice and greenery were in the bottom of the jar, the beans are stacked vertically so a tight bunch fills the jar. If your beans are long, cut them in half, and if they are then too short for the jar, lay them sideways instead. Make a brine, I needed a cup and a half of water in which I placed 1 ½ tsp of granulated Himalayan salt. Fill the jar with brine until the beans are covered, place some kind of food safe weight on top, drop your pepper corns in if using, then seal your jar. These will be ready in 10 days, but will be excellent at 21 days. If not using mature kraut liquid as a starter, double those times.